(Nanowerk Spotlight) Continuing miniaturization has moved the semiconductor industry well into the nano realm with leading chip manufacturers on their way to CMOS using 22nm process technology. With transistors the size of tens of nanometers, researchers in the field of nanobiotechnology have begun to explore the interface of biology and electronics by integrating nanoelectronic components and living cells. While researchers have already experimented with integrating living cells into semiconductor materials (see "Scientists integrate living brain cells into organic semiconductors") other research is exploring the opposite way, i.e. integrating nanoelectronics into living cells. The study of individual cells is of great importance in biomedicine. Many biological processes incur inside cells and these processes can differ from cell to cell. The development of micro- and nanoscale tools smaller than cells will help in understanding the cellular machinery at the single cell level. All kinds of mechanical, biochemical, electrochemical and thermal processes could be studied using these devices. A typical human cell is the size of about 10 square micrometers which means that hundreds of today's smallest transistors could fit inside a single cell. 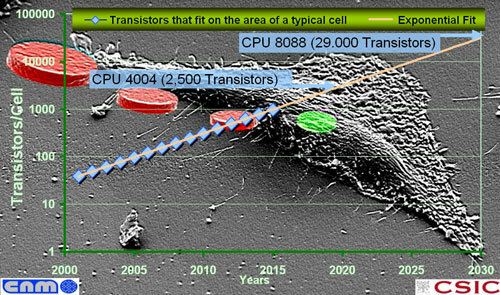 If the current rate of miniaturization continues, by 2020 approximately 2.500 transistors – equivalent to microprocessors of the first generation of personal computers – could fit into the area of a typical living cell. "Today's micro- and nanoelectronic processes already would allow us to produce complex 3-dimensional microscale structures as sensors and actuators" José Antonio Plaza tells Nanowerk. "Complex structures, smaller than cells, can be mass produced with nanometer precision in shape and dimensions and at low cost already. Furthermore, many different materials (semiconductors, metals, and insulators) could be patterned on the silicon chip with accurate dimensions and geometries." Plaza, a researcher at the Micro and Nanosystems Department, Instituto de Microelectrónica de Barcelona IMB-CNM (CSIC), together with a team of colleagues, has demonstrated that silicon chips smaller than cells can be produced, collected, and internalized inside living cells by different techniques (lipofection, phagocytosis or microinjection) and, most significantly, they can be used as intracellular sensors. The team has published its findings in a recent issue of Small ("Intracellular Silicon Chips in Living Cells"). Plaza points out that many studies have dealt with the fabrication and the cellular uptake of differently shaped and organized micro- and nanoparticles. These particles are mainly produced by chemical synthesis and they have been demonstrated to have a high impact in nanomedicine. "Conversely" he says, "silicon chips have shown to have near endless applications in many areas of modern life. Thus, the question in our work was to demonstrate that silicon chips, produced at the scale of the micro- and nanoparticles, can be used as intracellular sensors. These chips are made of a typical semiconductor material – silicon – and produced by common industrial manufacturing technologies based on photolithographic processes." In their experiments, the Spanish team fabricated different batches of polysilicon chips and then chose the most suitable device type with lateral dimensions of 1.5?3µm and with a thickness of 0.5 µm to be placed inside living cells. Cells were taken from Dictyostelium discoideum and human HeLa cells. 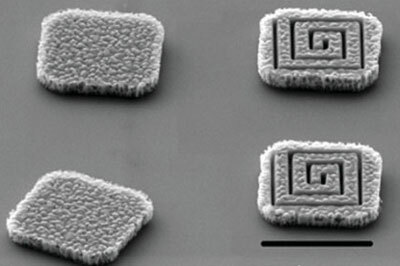 To further demonstrate the versatility of the technique, they studied the integration of different materials in a single chip and their 3D nanostructuring capability by using other common microelectronics techniques such as FIB milling. "Preliminary experiments incubating HeLa cells with polysilicon chips gave low yields of internalized intracellular chips" say Patricia Vázquez and Teresa Suárez, the biologists on the team. "We then used lipofection (encapsulation of materials in a lipid vesicle called a liposome) to obtain higher rates of ICC-containing cells." After inserting the chips into the live cells, the researchers made sure that the cells remained alive and healthy. They found that over 90% of the chip-containing containing HeLa cell population remained viable 7 days after lipofection. "Based on our experiments we can conclude that silicon-based top-down fabricated intracellular chips can be internalized by living eukaryotic cells without interfering with cell viability, and functionalized chips could be used as intracellular sensors since they can interact with the cell cytoplasm" says Plaza. "These chips have similar dimensions to many synthesized micro- and nanoparticles but they have the advantages of silicon-chip technology. Intracellular chips offer higher flexibility and versatility in shape and size and they can be nanostructured in three dimensions and integrated with several materials (semiconductors, insulators, metals) at chip-scale level." The main applications of future intracellular chips will be the study of individual cells as well as early detection of diseases and new cellular repair mechanisms. The Spanish team envisions that intracellular silicon-based chips will provide endless possibilities for the design of innovative devices with intracellular applications and are an indication of where nanotechnology can be used in the future. "In the near future, novel intracellular chips will permit the characterization and quantification at the single cell level, and the in vivo real-time monitoring of cellular events, as well as specific targeting to the sites of action or efficient drug delivery within target cells" says Plaza. What the Spanish team has done is just a first step towards innovative intracellular silicon-based MEMS and NEMS. Where will nanotechnology take us in this area? The challenges for future research will be the development of new technologies to produce MEMS and NEMS smaller than cells (small devices with mechanical, electrical, magnetic and/or chemical parts). Clearly, the effect of these structures on the cell viability is a fundamental issue. Although the initial observations were promising, further systematic cytotoxicity and biocompatibility tests will be necessary if new materials or 3D structures are going to be used for intracellular applications. "How these devices are going to interact with living cells and perform sensory activities is a new fascinating query" says Plaza.